Torco SD-5 Synthetic Diesel UNIVERSAL - Pann Auto Performance - San Diego largest aftermarket automotive performance parts - What do you drive? 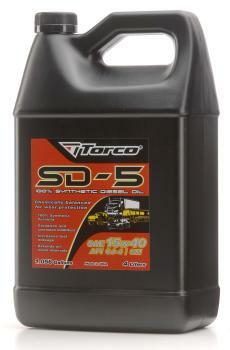 SD-5 Super Diesel Motor Oil is designed for long drain intervals in engines using high sulfur fuels. It meets warranty requirements of American, Japanese and European diesel engine manufacturers. With high alkaline reserve (9-TBN) and corrosion inhibitors, SD-5 Super Diesel protects bearings against acids formed during combustion of high sulfur fuels. SD-5 Super Diesel Motor Oil is a blend of highly refined hydrocracked base oils and the most advanced detergents and dispersants plus Torco’s SD-5 friction and wear reducing additive. Low sulfated ash and superior anti-wear properties contribute to longer engine life, fewer oil changes and less waste oil. Recommended for diesel engines using high sulfur fuels and is suitable for low sulfur fuel and gasoline engines. Highly recommended for all turbo charged engines for the following specifications: CI-4/SL, CH-4/SJ, CG-4/SJ, CF- 4, CF-2, CE, S-3, MIL-L-2104D, MIL-L-2104F, MIL-L-4612E. Also exceeds the following: Mack T8E, T9, EO-M, EO- M Plus EO-L, EO-L Plus, EO-K, EO-K2 and T-7 / Cummins 20071 & NTC400 / Caterpillar TO-2 / Daimler Benz 228.1 / Volvo VDS-2 & VSD / Volkswagen 501.01 and 505.00 / Detroit requirements / European diesel ACEA E1- 96, E2-96, E3-96 / Allison C-4 torque fluid and heavy duty manual truck transmissions.